Common Carpenter bees look like large bumble bees with a bare abdomen, lacking the yellow hairs found on bumble bees. This type of stinging bee gets its common name from its habit of boring into wood like a carpenter. Carpenter bees are solitary insects. Females bore circular holes through soft wood to lay eggs and protect their larvae as they develop. Young adult carpenter bees hibernate over winter, typically in abandoned nest tunnels and emerge in the spring to mate, initiate nests, and feed on nectar. Carpenter bees are a serious property threat, as they can cause structural damage over time. Male carpenter bees can be territorial and may hover in front of one’s face aggressively, but they have no stinger and these actions are merely for show. 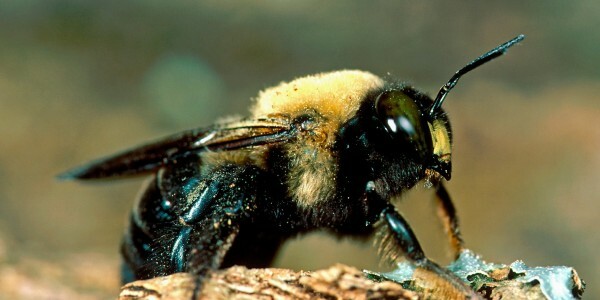 Female carpenter bees do have a potent stinger, but it’s rarely used.